Particulate Meter monitors pollution in buildings. With OMEGAÂ® HHTP21, users can be proactive in measuring fine and course particulate pollution that comes from many different types of sources. 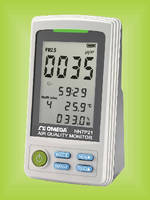 Handheld unit offers measurement ranges of PM2.5 from 0–500 Âµg/mÂ³,Â humidity from 1–99%, and temperature from -4 to 140Â°F. Meter includes Data Hold and Max/Min with time stamp function, 6-color LED indication of air quality at Good/Moderate/Poor, and preset warning point with buzzer alarm, LED, and alarm output. The OMEGA® HHTP21 handheld particulate, humidity and temperature meter allows you to be proactive in measuring fine and course particle pollution that comes from many different types of sources, so you can improve your air quality before it becomes dangerous. Particle pollution is linked a number of health problems, including coughing, wheezing, reduced lung function, asthma attacks, heart attacks and strokes--it’s also linked to early death. The HHTP21 is ideal for monitoring particulate pollution in burning plants, petrochemical facilities, thermal power plants, restaurants, hospitals, mining facilities, metal refineries, commercial and public buildings. ATTN Editor, please include this link to the complete spec sheet page in the printed product release: http://www.omega.com/pptst/HHTP21.html. Laser Scanners offer volumetric measurement of bulk solids. Hematology Analyzer performs CBC and CRP in 4 minutes. Global S Coordinate Measuring Machine comes with PC-DMIS or QUINDOS software. Pick-and-Place Machine measures placing force.